I love Benitez to bits, but he’s doing one thing that will absolutely infuriate Mike Ashley.. – NUFC blog – Newcastle United blog – NUFC Fixtures, News and Forum. I love Benitez to bits, but I’m often sat scratching my head when I see him select Joselu in his squad over £10m man Muto – and I think Mike Ashley may be too. Before I go any further, this is just an observation of mine and not any rant at Rafa, with me simply playing devil’s advocate on this one given it’s something I think quite a few fans will be wondering themselves. My point being, whether we like it or not, Ashley is reluctant to spend, and the £9.5m signing of Muto was his biggest outlay over the summer. Rafa picks the team – he’s the expert – but if Mike is seeing our manager pick a misfiring striker who’s often struggled to hit a barn door, hold the ball up or impact the game in any way over a bloke Benitez wanted for £10m, he’s not going to get it. As we know, Muto’s had a difficult start to life at St James’ Park, with him starting very few games and still struggling with the language barrier by all account, but Rafa regularly praises his performances in training – and, based on his energy levels whenever we do get to see him, it doesn’t look like he’s unfit or suffering from attitude problems. Maybe Rafa just wants a big man on the bench incase Rondon gets injured, but myself and a few around me at the game on Saturday where a little baffled to see how Joselu is being selected over the Muto. Rafa’s got so many signing right – with Schar, Fernandez, Dubravka, Rondon, Kenedy (last year!) and Ki all looking like brilliant budget buys loan – but Ashley is no doubt always looking for an excuse not to spend, pointing the finger at any past mistakes (as he apparently did after Sels, Lazaar and Gamez flopped). Muto has actually looked lively to me more often than not, and I’m by no means saying he’s flopped already, but Benitez isn’t going to strengthen his argument to get more ‘big money’ buys over the summer when his two most expensive buys aside from Almiron are A) left out of his matchday squad (Muto) and B) out on loan in the Championship (Murphy). 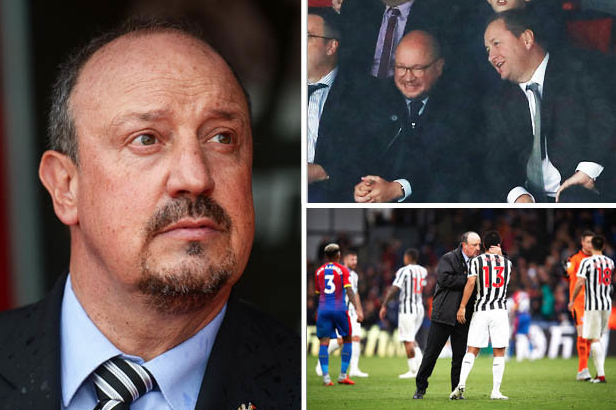 I back Benitez – after all, he knows what he’s doing more than I ever could, he analyses the opponent and watches them all train every day – but I just don’t quite get this one with Muto; and I doubt Ashley’s too enamoured. Agree to a certain extent but could it also be that Muto was a signing Rafa didn’t actually want? From MA’s perspective Muto could have been a signing to help boost our profile (hence sales) in the Asian market. Also it has been mentioned that Muto has failed to reach a decent command of the English language so it may be that Rafa prefers Joselu as he can at least communicate his instructions to him. I’d still be having Muto on the bench regardless, my blind granny would be more effective than Joselu. Good point. I even wonder if Murphy was a Rafa buy..
Wouldn’t surprise me if MA knew young English players soon double or triple in price if they do well at PL level so thought £10m was a risk worth taking. I think Muto will be a more of a long term project whilst he settles to life and England and after the Asian cup. I reckon Joselu will be earmarked for a transfer out for trying to maximize value by giving him opportunities late in games.